Buy server from HostingRaja with 44% offer. Buy web space or server space from HostingRaja, the No.1 web space provider in India. We are one of the top webspace providers in India, We use advanced & cutting edge technology to help our customers and our business is mainly driven by customer-centric approach. When you buy hosting space with us, We give the discount of 44% on hosting space cost. Our hosting space price is very cost effective and you can get it for cheap and best price with HostingRaja. On every webspace purchase, you get FREE domain name, But only applicable for Unlimited or Premium hosting. What is server space / hosting space / web space? Server Space is self explanatory. It is a space on the server that is provided by hosting companies like Hosting Raja for certain server space cost . Server spaces are leased out to clients so that they can use the same to host their websites. When compared to the cost of developing a website, the server space cost is relatively less. Some sites have even started charging their clients based on the traffic that they incur. This is because server space is much cheaper than monitoring a website that is attracting a lot of traffic. Server Space requirements vary depending of the client’s business. If you are looking to put up a single page website with some images and content which talks about your business, all you need is Single Page hosting which requires very little server space. On the other hand if you are looking to host a complex website which stores information of the people visiting it then the amount of server space required increases drastically. If you want to run web applications then again the server space requirements go up. Before you approach a Hosting company like Hosting Raja, make sure you know exactly the amount of server space that you need for your website. You can also take a look at our plans to get a fair understanding of how the server space is allocated to different plans. Huge discussion portal website and website which have more users they should buy server space for website because of their adaptability and site speed. Because of a present issue tremendous high activity are to be handled, the dedicated web server space can illuminate these better. If you need purchase server space, HostingRaja will give some numerous plans server space for website. Server space companies with different server packages for both Windows and also for Linux. Overseen Dedicated server designs both the Linux Server and the Windows Server an ideal answer for hosting with full root and admin rights. You get a HostingRaja server space, which you can oversee and control totally. Also you can get the plesk Admin Panel pre introduced on your server. The cost straight forward server capacities enable you to increment or diminishing the execution of your server whenever on a day by day or month to month basis. For more data about the server highlight and server space cost in india you can refer our hostingRaja online server space plans. I am utilizing Hosting Raja for a long time. I have discovered their Staffs are extremely Helpful around then when we require them. Hosting Raja’s Website is very much Designed and straightforward for Beginners as well. HostingRaja services are outstanding. I have tried few hosting companies and hostingraja is one of them. In the beginning, as a newbie had some depressions, but hostingraja has secured a good position within me. Their hosting services are good and the features offered by them are very useful. 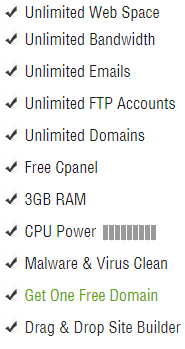 Previously tried few companies but after coming to hostingraja uptime is perfect. The customer support is excellent. I am very much impressed and happy about the service provided. Hostingraja is the best service that I have ever used. Thank U.
HostingRaja service is helpful in hosting services. I have been their client for more than 8 months. Their support is good and reliable. I am happy with their overall services. I have tried many hosting companies, particularly my previous service provider was very poor. They were trying to fool customers and loot money. After coming to HostingRaja my business was going well and they offer me 99.9% uptime every time. Overall HostingRaja service is great. Hosting Raja is one of the top Domain name registration and web space company in India. We are the only company in India, which provides support in regional languages. Choices are many for Domain Registration & Hosting. The question you need to ask is - "Do they provide any value added services?" or "Are they available when you are in trouble? or "Do they help in setting up your Emails".Try "HostingRaja", the No.1 Web Space Company in India. Host your websites with the best in Industry & Leave burden of hosting to the most reliable & best support team in the Hosting Industry. NO Hidden Charges, NO Extra Fee and NO set up charges, This is our policy and promise to our customers. We provide 99.9% uptime and "Anytime Customer Support (24/7)" in 12 regional languages. We have become a trusted name in the industry with 100000+ clients all over India. Our cutting edge technology in web space, Makes us pioneers in providing uninterrupted service to all our customers. How to buy server ? Can I transfer to HostingRaja ? You can transfer to HostingRaja from any other hosting company, We take care of A - Z work. For more information, Please visit, https://help.hostingraja.in/transfer/ . I have bought a Web Space, What next ? What hosting is suitable for my need? Do I need to buy hosting to have a website? Yes, you need to buy a server to have your website working. Buying domain name alone will not help you to have your website working. Buying a domain name is just like registering a domain name in Internet, You need to buy hosting to host your website. What is the best web server ? HostingRaja is one of the best & cheap hosting company to buy cheap (web) hosting in India, We provide cheap hosting services for about last 7 years. Do you provide unlimited hosting ? Yes, We provide unlimited hosting services based on Indian Data Centers. Do you provide premium Plans ? Yes, You can buy server space from us under premium shared hosting and also, this will be one of the top hosting in India to create your website. Our server storage plans support CMS such as Wordpress, Joomla, Drupal, Magento and much more. Our Linux hosting comes with PHP and MySQL Databases. Our packages include email, FTP, and sub-domains. Tier-4 Data-center with the latest technology. Free Control Panel, Database Manager, Add-on or Parked Domain. and much more of features included.